Home / Stock Picks / Hot Stocks / There’s Smoke, But Is There Still Fire for ACB Stock? Cannabis stocks are climbing this year and Aurora Cannabis (NYSE:ACB) is among the leaders of that pack. Shares of ACB stock have nearly doubled year-to-date and are in the midst of a breathtaking March rally of more than 33%. That is not an impossible climb for ACB stock, but the near- to medium-term issue is finding upside catalysts because plenty of good news is already baked into this marijuana stock. For example, ACB surged earlier this month on news activist investor Nelson Peltz is joining the company as an advisor. That sent ACB stock to a double-digit intraday gain and the shares are up more than 11% since then. “While establishing 20% market share has been an early success story in Canadian adult use cannabis, the company is uniquely positioned to drive leadership in both share and profitability,” Azer wrote in a note, according to Barron’s. Some analysts also view valuations on ACB stock as favorable relative to other marijuana names. Consider this about the valuations assigned to some weed equities: Aurora Cannabis stock trades at a forward P/E ratio of 101 and a price-to-book ratio of 3, according to Morningstar data, and that’s considered a value relative to its peer group. 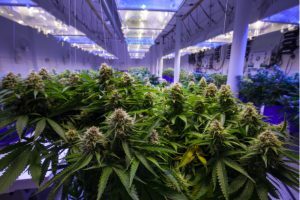 Think Constellation Brands (NYSE:STZ) taking a multi-billion stake in Canopy Growth (NYSE:CGC) or Altria (NYSE:MO) forming a partnership with Cronos Group (NASDAQ:CRON). Last year, it was rumored that Coca-Cola Co. (NYSE:KO), the world’s largest soft drink company, held talks with Aurora to develop cannabidiol-infused beverages, but a deal did not materialize. Article printed from InvestorPlace Media, https://investorplace.com/2019/03/theres-smoke-but-is-there-still-fire-for-acb-stock/.